I am back in Israel now! Greetings from the Land! I posted this blog a year ago — but I am posting it again so you can see Bethlehem from a unique perspective, from my bike. 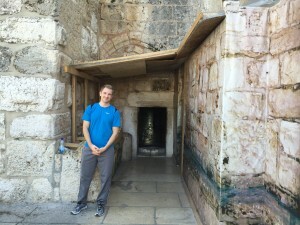 I think you will enjoy this fun and educational adventure riding through Bethlehem and Jerusalem today. We are in Israel with my daughter Charlotte, her husband Wesley and my wife Janet. We are picking up our bus full of people tomorrow at the Tel Aviv airport. We are looking forward to a wonderful pilgrimage through the land of Our Lord. 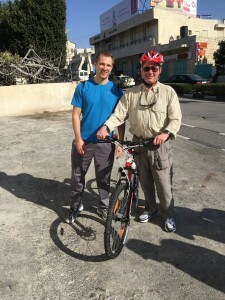 We arrived a day before our group so my son-in-law and I decided to take an adventure from Jerusalem to Bethlehem and back. Yesterday was Christmas and here in the Land it will be Christmas until January 6. So we started our run and bike ride from the birthplace of Christ to the place where he was crucified, buried and rose again. We had a great time together getting good exercise as we explored the land of the Bible. We all hope you enjoy this video and it again reminds you of the truth of the Catholic Faith. It is rooted in history and is true with a capital T.